Drop night is QUICKLY approaching, and I just wanted to write about it and what it means to us. First and foremost, it is set for Friday, June 2nd, 2017 at 7:00PM for Dan's class at ENJJPT. What is drop night? I get asked this question ALL. THE. TIME. Drop night is when the student pilots from one class (my husband is at Euro-NATO Joint Jet Pilot Training (ENJJPT) at Sheppard Air Force Base, but there are three other Air Force Undergraduate Pilot Training (UPT) bases too - Vance AFB, Laughlin AFB, and Columbus AFB) find out IN FRONT OF EVERYONE what plane they will be flying for their Air Force career. Dan is specifically in class 17-06, but there is a drop night every six weeks here at Sheppard. The dates vary with the other three UPT bases, but drop nights happen at regular intervals. How are the student pilots selected for their aircraft assignments? I also hear this one a lot. The student pilots are ranked within their flights and their classes (each class has two flights) based on several factors from their training, check rides, etc. throughout the year-long program. They also get to submit a "dream sheet", where they rank each and every aircraft the Air Force has to offer, starting with their top choice and going all the way to last place. Based on their ranking AND what they hope the fly, the people who choose just kind of go down the list. What does Dan hope to fly? This is probably the most frequent question I get from family and friends - ALL THE TIME! While he certainly has preferences (and I'll get to those), he has longed to be an Air Force pilot for so long that he will just be happy to get paid to fly anything! He's not one of those people (and oh do they exist!) who will be super upset and unable to function if he doesn't get one of his top choices. But, hey, Air Force Gods... it wouldn't hurt to give him one anyway! ;-) Dan's top three planes on his dream sheet are the F-35, F-22, and F-15E. We really struggled to place those in any kind of order, though, so if he gets ANY of those top three, it'll be like winning the jackpot! His next three are the F-16, A-10, and F-15C, which would still be cool but aren't AS desirable. Then, he skips down to the heavies - or cargo planes - C-130, C-17, C-21, C-5, etc. After the heavies come the bombers and finally FAIPing, which is what we absolutely do NOT want (staying here at Sheppard and him being an instructor pilot - he's already a 1st Lieutenant, prior enlisted, and pretty old for the average student pilot), so we're hoping to avoid this step, but each drop has at least one and sometimes two in the mix... so we know it's still a possibility. No matte what the outcome, we are just excited to KNOW so we can start planning our next move! That's right - whatever plane he is assigned also tells us what specific base we will be moving to! We won't know EXACTLY when, but we'll have a pretty good idea, and the planner in me is just dying to start looking at houses, activities for Annabelle, an OB and hospital for Baby Cookie #2, etc. I NEED TO KNOW. This journey really has been a long time coming. When I met Dan in 2008, he was already in the Air National Guard and pursuing a degree in Aviation. 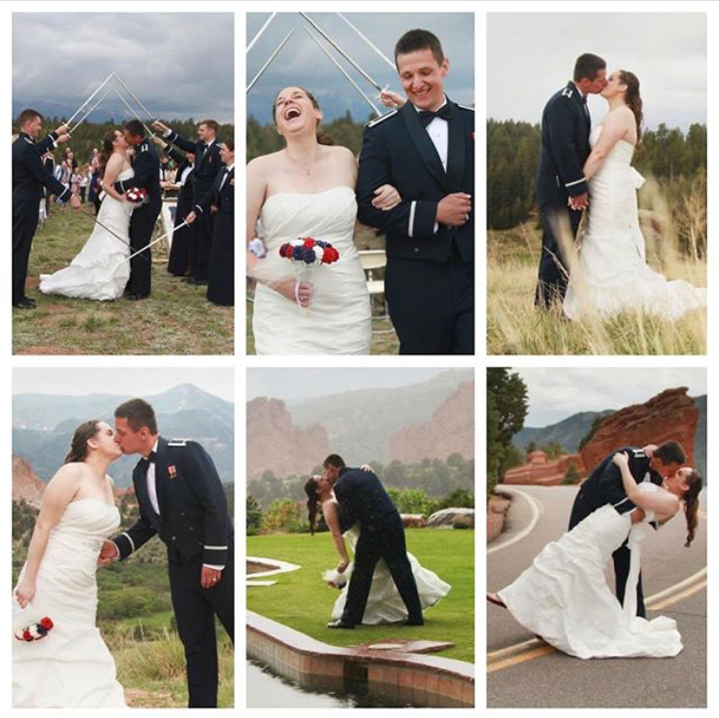 He had always dreamed of flying in the Air Force, but that didn't seem like a reality until he was accepted into the Air Force Academy shortly after we started dating in 2009 and went active duty. Basically, our entire relationship has been focused on this one long-term dream and goal. He has poured every little bit of himself into being the best cadet, then officer, then Master's student, and now student pilot that he could possibly be in order to achieve his dreams. No matter what aircraft he is assigned to, we know it will be the right fit for our family because you just don't work this hard for nothing. It's all coming to fruition NEXT WEEK, He will still have three more weeks of pilot training after drop night before graduation, but I can already tell those three weeks are going to be so amazing because we'll KNOW everything we need to know. No more guessing. No more fretting. Please pray, send good wishes, positive thoughts, crossed fingers, etc. our way next week, as I know we will both be an anxious, nervous wreck! 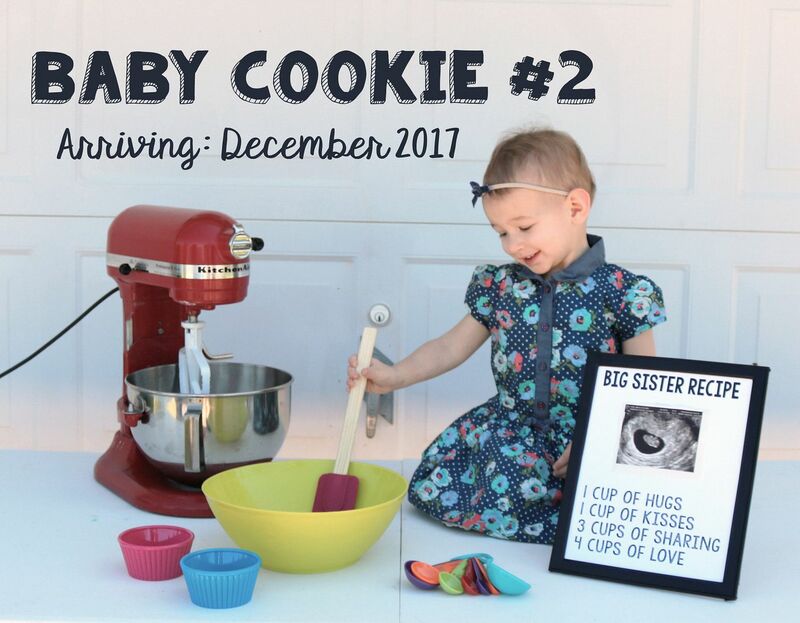 In case you missed our announcement on social media last night, I'm sharing it again! More details to come later... but for now... I'll just leave you with this. 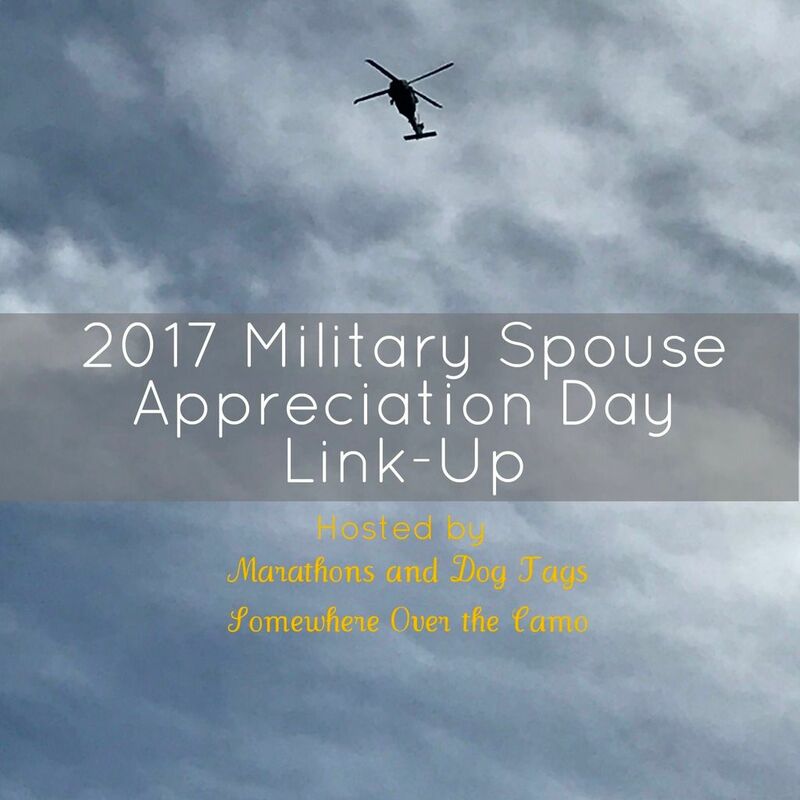 It's that time of year again - Military Spouse Appreciation Day! And a HUGE thanks to Jen and Amanda for hosting this link-up each year. I absolutely LOVE meeting new (to me) military spouses to connect with. I’m Janelle, and I’m an almost 30 Air Force wife, girl mom, and former middle school language arts teacher. I now own two Etsy shops that I work on during nap time. I started blogging here in January of 2013 to document our lives – and since my husband is a pilot (to be in the Air Force – almost there! ), the name Come Fly With Us was born. 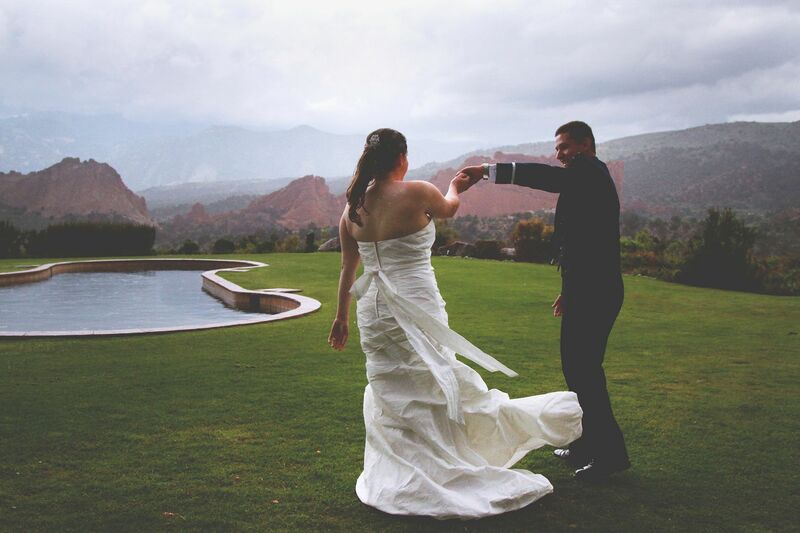 We also used Frank Sinatra’s Come Fly With Me as our first dance song at our wedding way back in 2014. I used to blog on a much stricter schedule, and while I do kind of miss it, my life just has other priorities now, so I try to post when I can so I’ll still have major events documented. I’m working on it. Dan is a part of the World’s Greatest Air Force! He is currently six weeks away from graduating from Euro-Nato Joint Jet PilotTraining at Sheppard AFB in Texas and only three weeks away from finding out his aircraft assignment! To say we are an anxious mess would be an understatement. He will celebrate 11 years in the military next month, but his journey has been anything but normal! 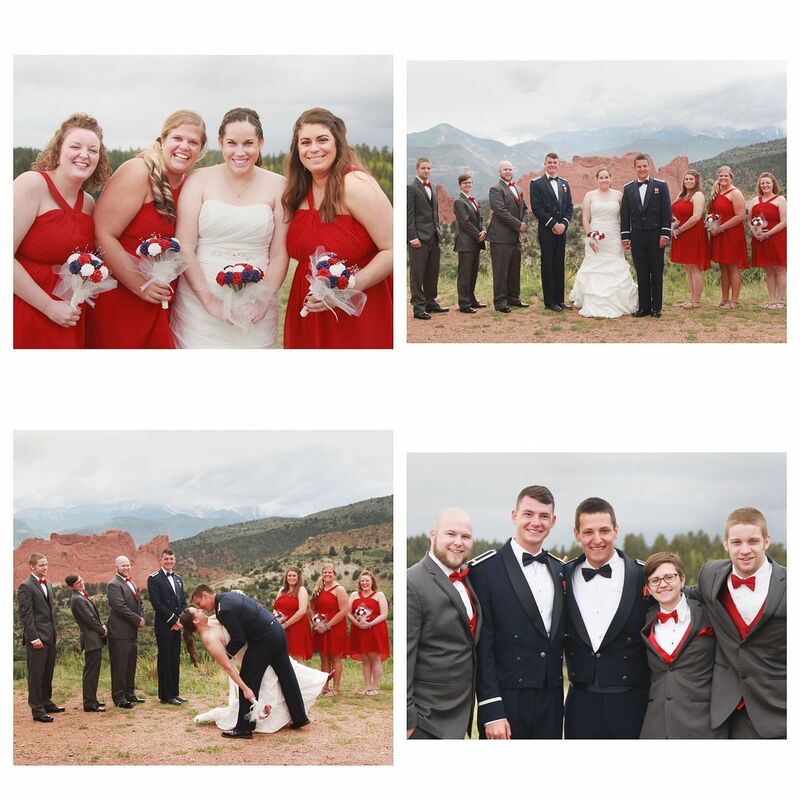 He first enlisted in the Army in 2006 and played trumpet in their band (in the Army Guard). He also played military funerals all the time. 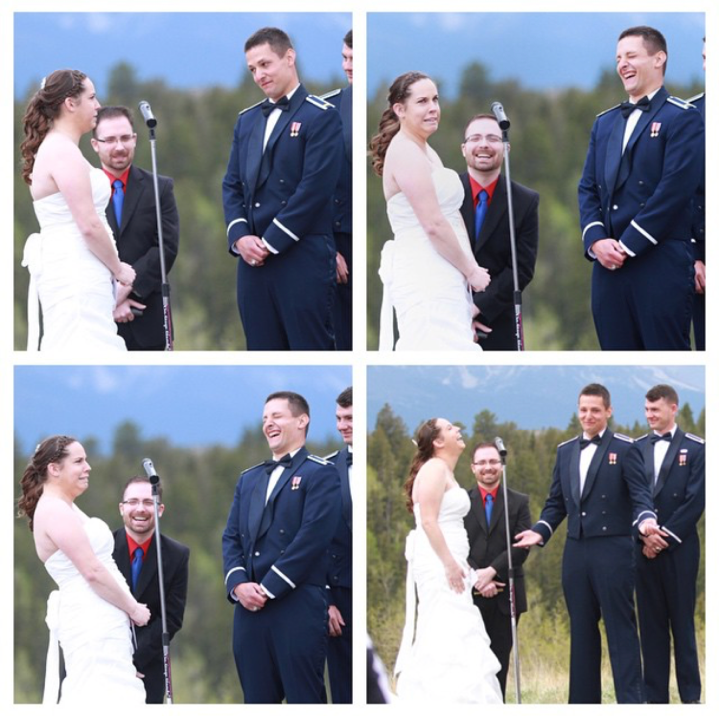 He transferred to the Air Guard eventually because there was an Air Force base near the college he chose to attend (where we met) and was working toward becoming a B-2 Crew Chief when we started dating. 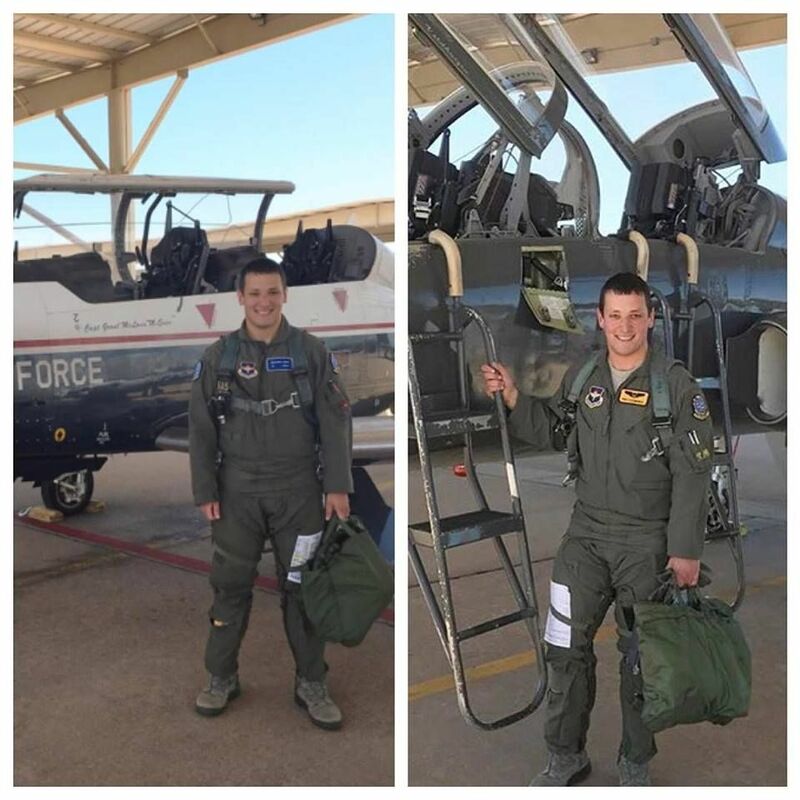 He applied to the Air Force Academy on a whim, got accepted, and spent five years in Colorado Springs doing his time there (including a year at the prep school), all while competing on their official Flying Team. He found out he got a pilot slot his senior year and was ecstatic – that was the DREAM all along! But then he was also accepted to graduate school, so he put his dreams of flying on hold for another 18 months to obtain his Master’s degree in Physics first at AFIT atWright-Patterson AFB in Ohio. The thing I love about the military lifestyle would definitely be how quickly spouses and significant others make friends. We don’t just become friends… we become FAMILY… because we all understand what it’s like to be away from our actual families. If someone is sick, people are there to take them what they need. If someone is going out of town for the weekend, someone is right there to take care of their pets. If someone has a baby, SO MANY people line up to bring the new mom a meal. It’s a wonderful sense of community, and it’s something I don’t think the general civilian population gets to experience on the same level. Every assignment is what you make it! If you’re going to an undesirable place, make a bucket list of things to do while you’re stationed there. Find a church (or other type of organization) to get plugged into as soon as you can. Have your spouse invite his flight/class/unit/etc. over to your new place for a cookout as soon as possible so you can get to know the people you’ll be spending most of your time with for the next year or more. Essentially, do the work upfront to make friends, and you’ll end up having a good time. I’m guilty of not enjoying a certain place as much as I should have, but I was a brand new spouse, and I have learned from that mistake for sure. I’m not just excited to find out where we’ll be heading next, even though I don’t hate our current base. //Where have you been stationed? Before we were dating, Dan was technically stationed at Whiteman AFB in Knob Noster, Missouri. He was in the Air Guard then, so he didn’t spend too much time there, as he was in college full time as well. 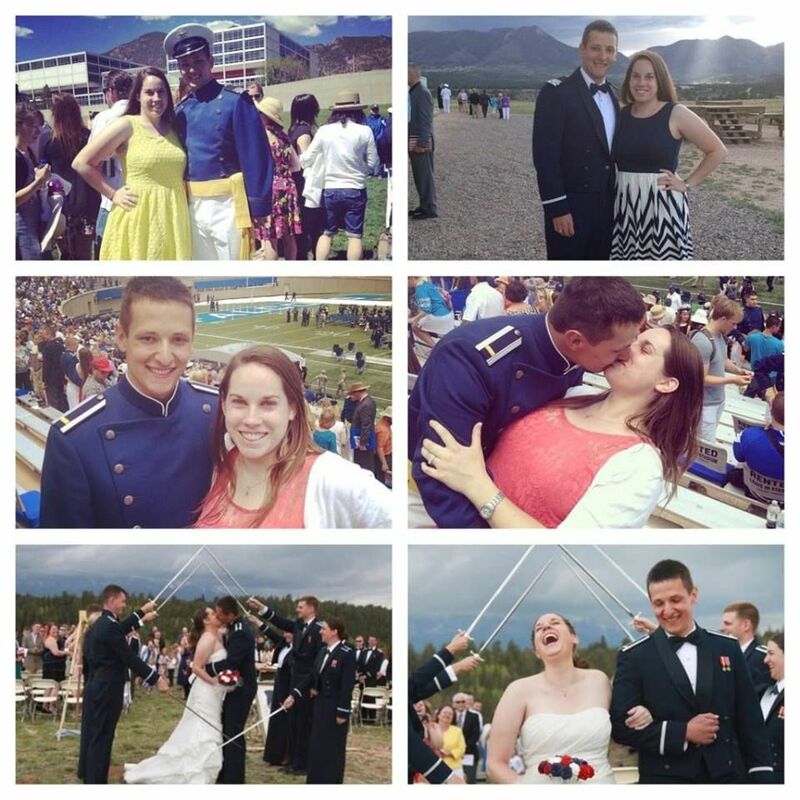 Then, he got in to the Air Force Academy, so we moved to Colorado Spring, Colorado. We weren’t able to get married until he graduated from there (no dependents allowed! ), but I moved out there and lived on my own while he stayed in the mandatory dorms. From there, we got married and moved to our official first base together- Wright-Patterson AFB in Dayton, Ohio. We were there for only 18 months, and then we moved to Sheppard AFB in Wichita Falls, Texas. We’ve been here for a little over a year and will be finding out super soon (next month!) where we’re heading next (most likely later this year). //Do you work, go to school, volunteer, or stay home? I taught middle school language arts for before having my daughter, Annabelle. I enjoyed the teenagers and do miss it some days. But for now, while she is young, we have chosen for me to stay home with her. Dan’s schedule is so unpredictable, so it’s best if one of us can be with her. I’ll probably get back into teaching in a few years, but who knows where the Air Force will take us! I hope to meet some new faces today after reading everyone's posts!